Bath is a beautiful city in England and there’s absolutely no reason why you can’t enjoy a family visit here with children. 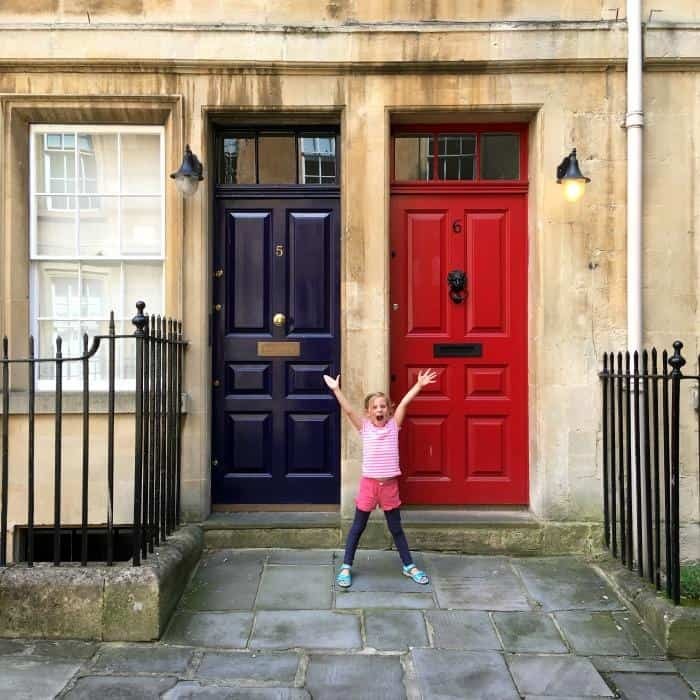 These things to do in Bath with kids will inspire you and your little ones to enjoy the very best of what this historic UK city has to offer. Bath had been on my list of UK cities to visit for many years, and I finally got to visit with my 5 year old daughter for a 2 day city break in the summer. We were on the look out for what to do in Bath as soon as our holiday was booked. We were super excited about our visit, but there’s always a little part of me that’s apprehensive about taking the kids to new places. Knowing where to go and the places to visit in Bath did make me feel a bit more in control though. Becoming tired during the trip, losing interest and starting to moan are all very real concerns when you are travelling with children, but I found that my daughter really enjoyed the visit to Bath. 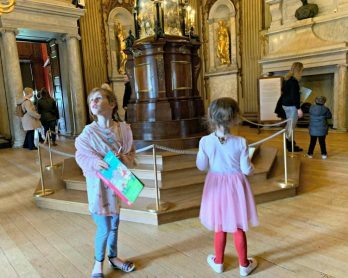 Because we loved our visit so much I thought I’d share what to do in Bath with children just incase you wanted to use this 2 day itinerary for your next visit with the family. Our first stop during our weekend in Bath was Bath Abbey. I really wanted to visit here as I find religious buildings fascinating despite not being a particularly religious person. I do, however, appreciate the part religion has played in history and shaping our culture. 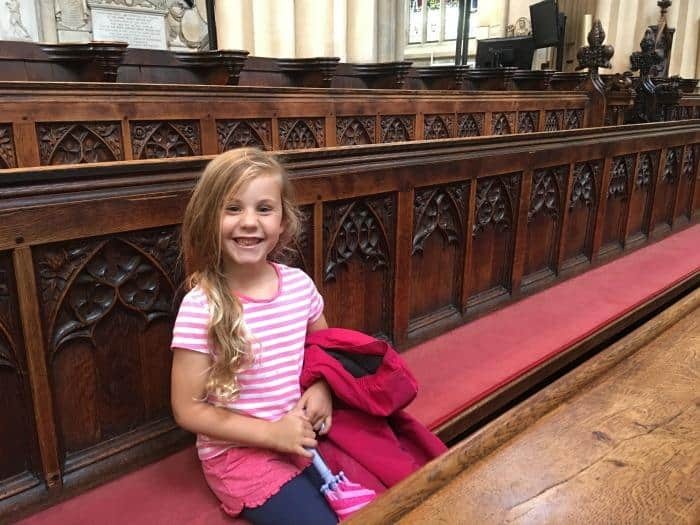 We both really enjoyed exploring the wonderful architecture, and my daughter was really interested in finding out more about why people visited Bath Abbey. Bath Abbey is just off York St in Bath city centre. It is free to enter, but donations are welcomed. Between March and October Bath Abbey is open from 10am – 5.30pm. Tower tours are available (Adult £8, Child £4) which last an hour and include climbing 212 steps. Once at the top you will enjoy stunning views across the city. For the latest tourist information about Bath Abbey visit the website. 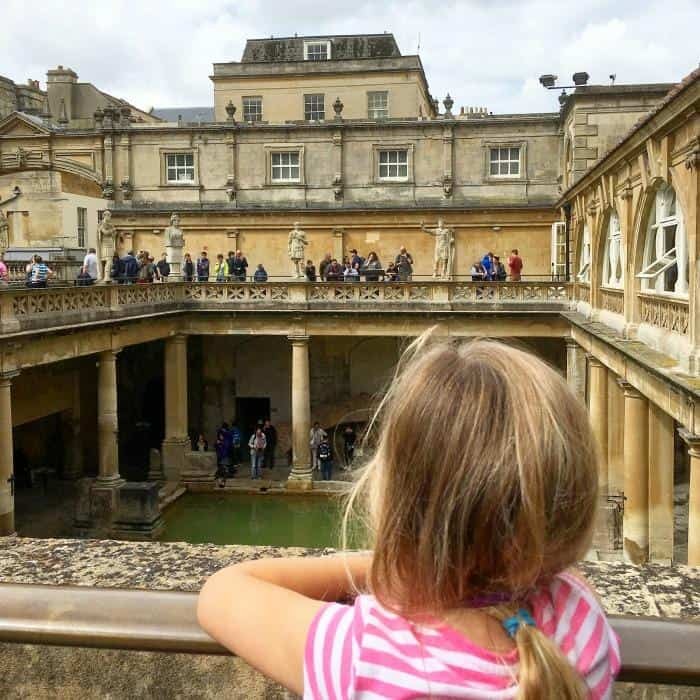 The Roman Baths are probably one of the best things to do in Bath with kids, and it’s a great place to take children to learn more about the history of Bath. There’s an audio guide specifically for children, which to be honest we both enjoyed, and lots of artefacts from when the roman bath spa were used by the Romans. We were also able to go to the activity room and learn about Eagle Bearers and why they were so important to the Romans when they were going into battle. Indie got the chance to make her own Eagle Bearer before we left, which she really loved. The Roman Baths can be found in Abbey Church Yard in Bath city centre, just a stones throw from Bath Abbey. 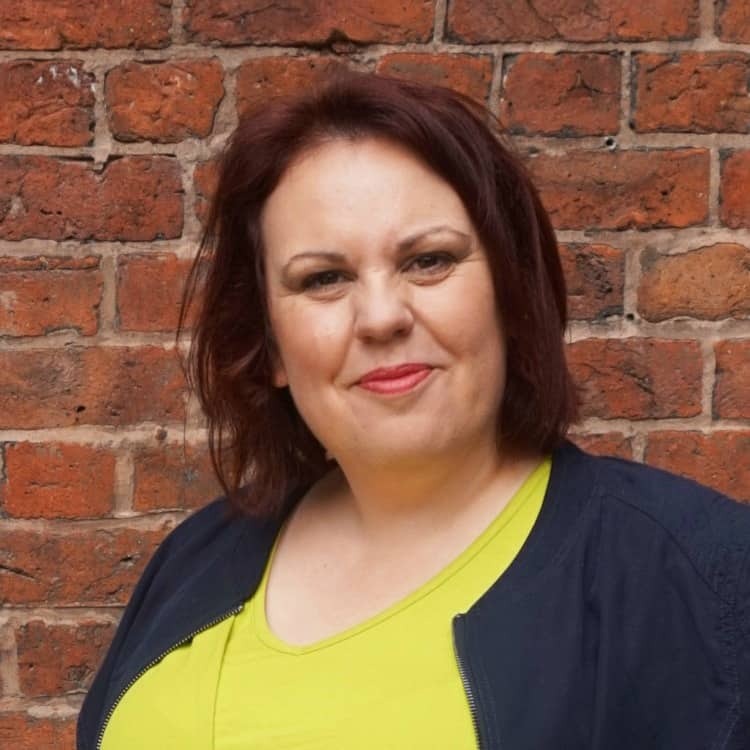 Tickets cost £17.50 for adults and £10.25 for children. Family and saver tickets are available. Between June and August The Roman Baths are open from 9am – 10pm and times vary for the rest of the year. 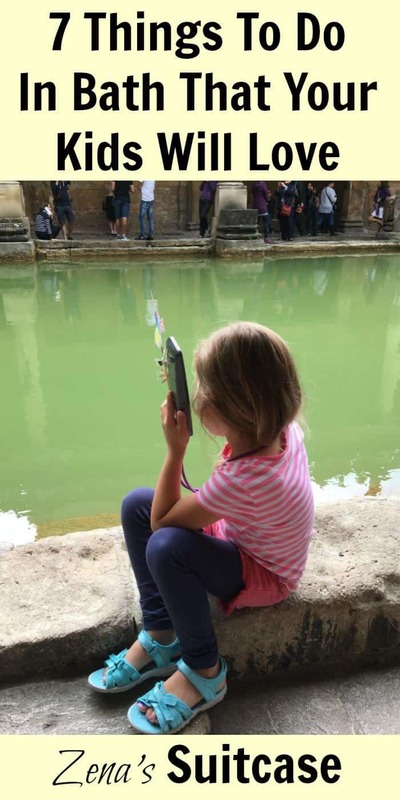 For the latest tourist information about The Roman Baths visit the website or visit Bath Tourist Information during your visit. 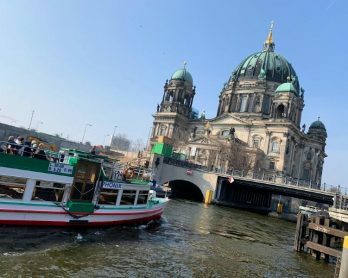 Going on the Bath sightseeing tours was a perfect way to break up our day and take a rest from walking around the city. 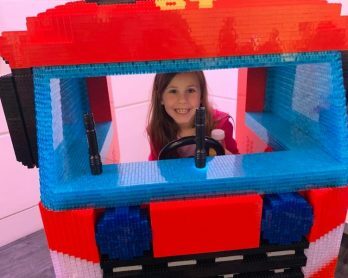 I think it probably saved my daughter hitting that whining stage when she gets a bit tired so we can definitely recommend it as one of the fun things to do in Bath with kids. The Bath city tour focuses on Bath city centre and lasts about 45 minutes. Our tour guide shared lots of interesting facts about Bath’s residents including Jayne Austen and Nicholas Cage! We also got to see some places we hadn’t managed to reach on foot, like the famous Promenade. 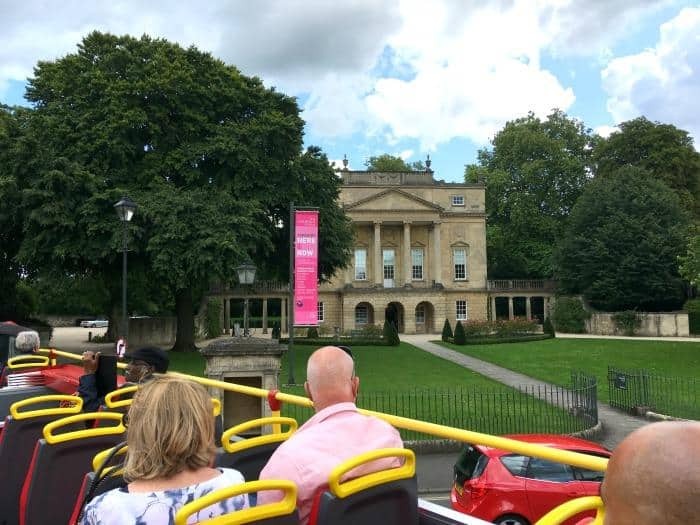 You can hop on and off the bus if there is a particular area of Bath you want to explore, but we equally enjoyed staying with the tour and taking the loop. The next day we took the Skyline tour, again just when I felt those little legs might need a rest, and we went outside of Bath to enjoy the countryside and wonderful views outside of the city centre. Be careful of low lying branches if you are sitting on the top deck though, as they come mighty close to the tour bus. It all adds to the adventure though, or if you’d rather not dodge the trees, take your seat on the drivers side of the bus! 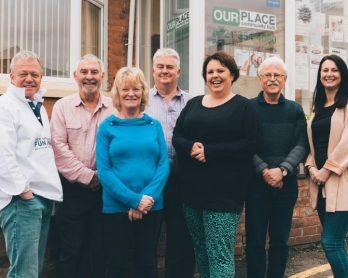 You can buy your Bath sightseeing tour ticket online or from the bus. Ticket prices start from £15.50 and include both tours. There are a total of 38 stops visiting all the major Bath attractions across the two routes and you can join the tour at any point. You can hop on and off as many times as you like and the buses run between 9.30am and 6.30pm. For the latest information about the Bath sightseeing tours visit the website. All that being said, do not be afraid to explore Bath by foot with children as it’s a beautiful place with a lot to offer. The architecture is incredible and this is why Bath is the only entire UK city to have been granted UNESCO status. As well as the buildings, the city of Bath makes a lot of effort to make the streets interesting for everyone. There were places you could pull up a deck chair and play a game of Connect 4 if it took your fancy. Always look up what’s on in Bath before your visit to find out what events are going to be on during your stay. They also had some stunning umbrella installations which we loved. 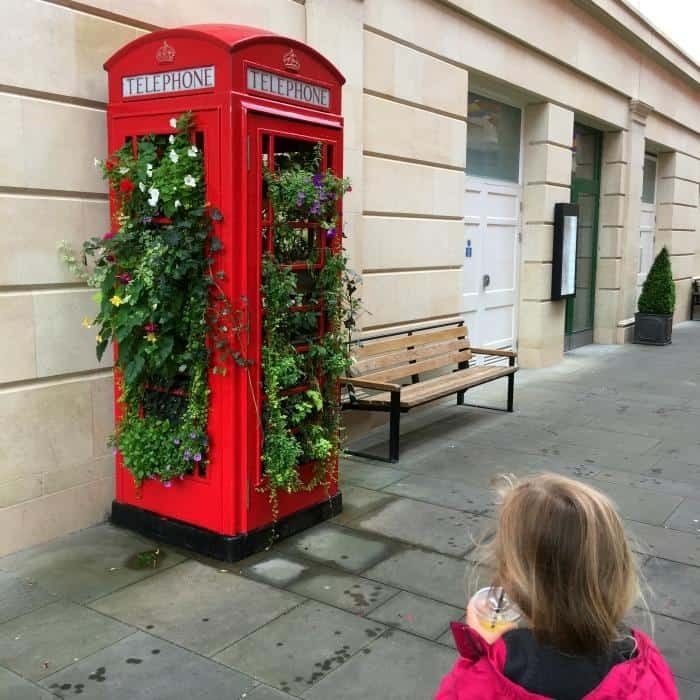 The interesting use of red telephone boxes also made for an interesting talking point during our Bath travel. When you are on the hunt for places to visit in Bath I can strongly recommend adding the Victoria Art Gallery to your list of tourist attractions. 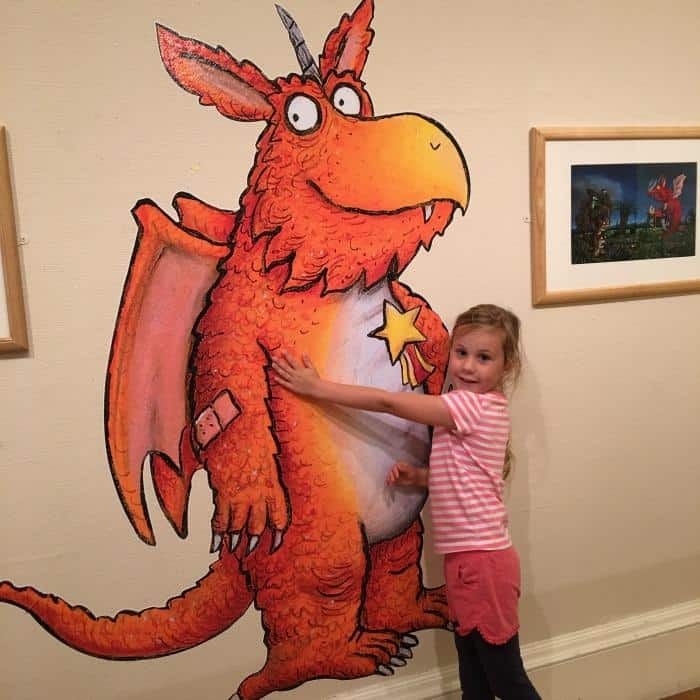 During our stay they were hosting a family friendly exhibition called Here Be Dragons which was so much fun. 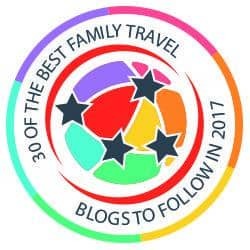 Make sure you take a look at their website for the latest family friendly activities and things to do in Bath UK. 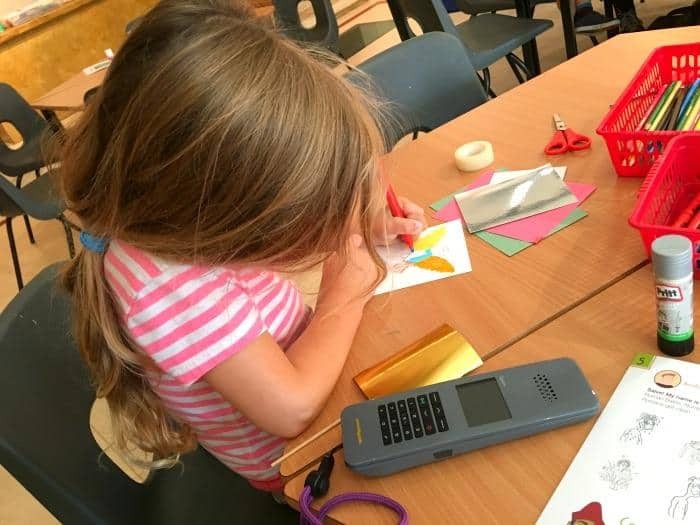 When we arrived there was a family art session taking place, and my daughter was able to create her own dragon inspired by what she had seen at the gallery. There was also a dinosaur egg hunt running, so that children could enjoy the more traditional exhibits on display here whilst having fun at the same time. It was a great visit, and one I can completely recommend if you are visiting Bath with kids. The Victoria Art Gallery is on Bridge St, Bath BA2 4AT. Tickets cost £4.50 for adults and children under 16 years old are free. Family and saver tickets are available. Victoria Art Gallery is open from 10am – 5pm daily. When we were thinking about what to do in Bath I knew a boat trip would definitely feature on our itinerary. It was another opportunity to change the pace of the trip and was a lovely thing to do late afternoon. We saw a boat taking passengers just over Pulteney Bridge and made a quick dash to catch it before it left. It was a beautiful blue sky day making for a lovely trip down the River Avon to the village of Bathamptom. 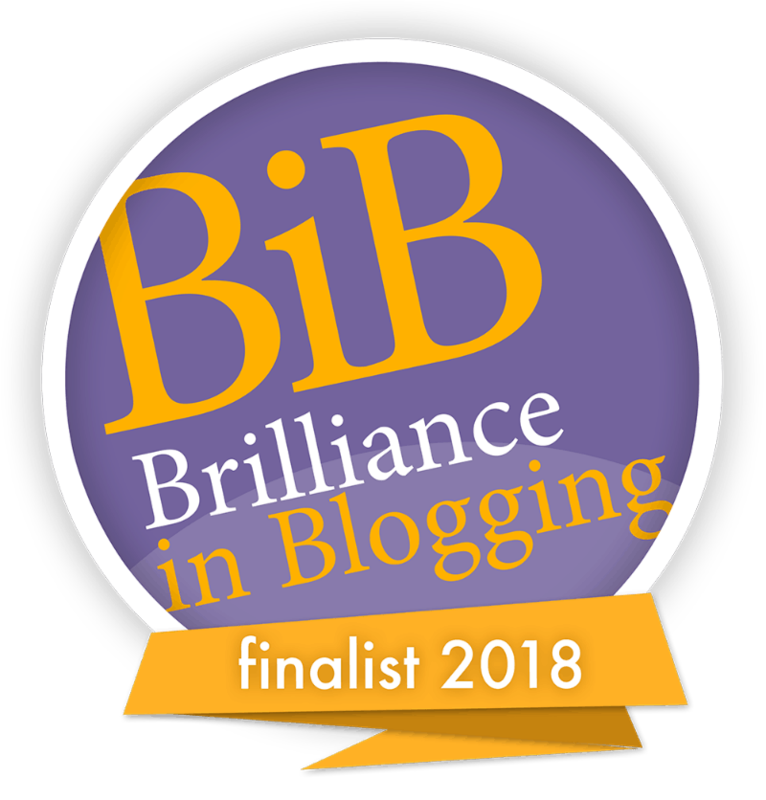 I was really pleased we added this to our weekend in Bath. The boat trip takes about an hour, and drinks and toilets are available during the trip. On the return trip we received a commentary about the history of the River Avon and the local wildlife which helped to keep my daughters interest. We spotted several birds during our trip, but no otters unfortunately. Regardless though it was still one of our favourite things to see in Bath. 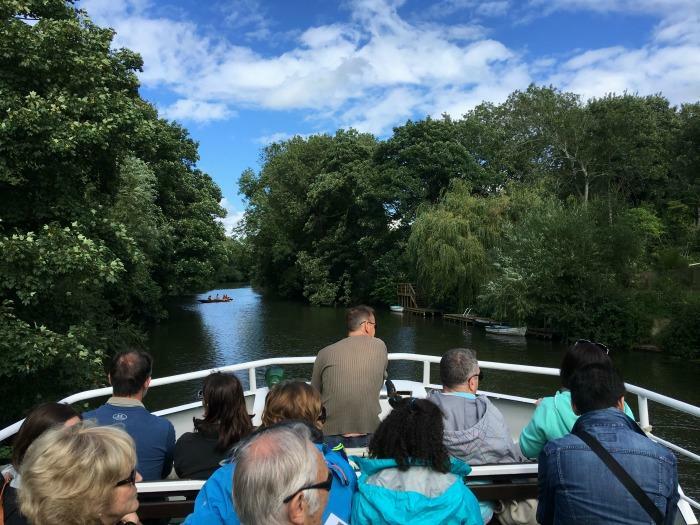 You can join the Bath boat trip at Pulteney Weir and tickets are purchased onboard. Tickets are £9 for adults and £4 for children aged 5-15 (under 5’s go free). Pulteney Cruisers run every 40 minutes between 10am and 5.20pm. For the latest information about Pulteney Cruisers visit the website. 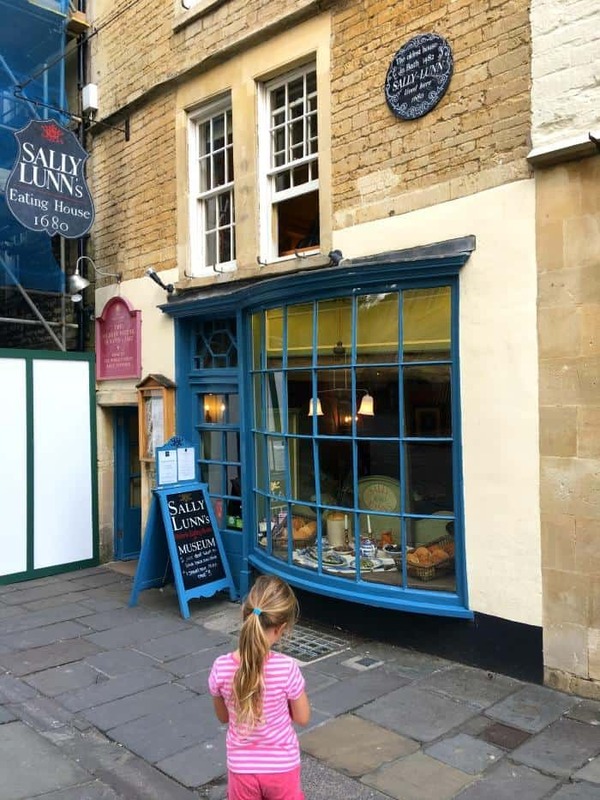 Sally Lunn’s is now a thriving tea room in Bath city centre, but it’s also famous for the bun that Sally baked there in the 1700’s. We didn’t stop for tea unfortunately, but we did pop down to the museum kitchen to see where Sally baked her bun. It is a small exhibition, but it’s fascinating to see Sally’s original kitchen. Sally Lunn’s house is also believed to be one of the oldest houses in Bath, so it’s a landmark well worth adding to your list of what to see in Bath. Bath is an incredibly beautiful and interesting city, and we found it to be a very child friendly place to visit too. We very much enjoyed our Bath weekend break over the summer and if you are looking for places to stay in Bath as well read our review of Travelodge Bath Waterside Hotel. For places places to eat in Bath you can also read about Jamie’s Italian and Wagamama’s to check out their kids menu which we’re also happy to recommend for family friendly dining in the city. Have you been to Bath with children? 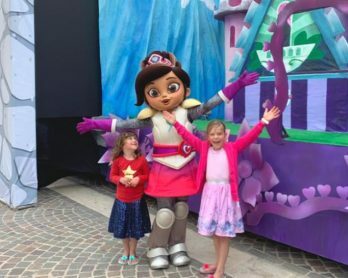 What things to do in Bath with kids would you recommend? 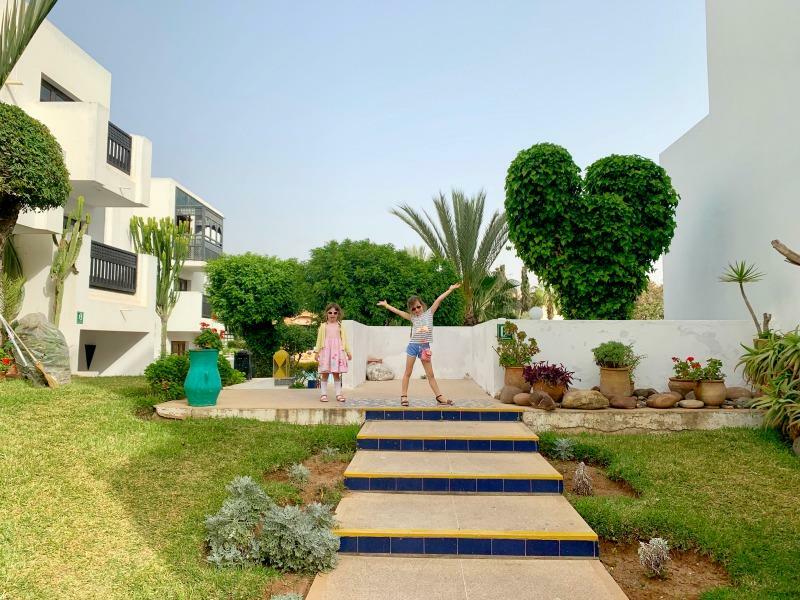 Have you read the Ultimate Guide to Making Family Travel Easier yet? It’s awesome! 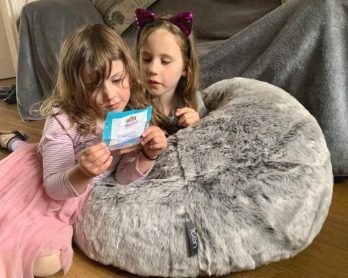 Visit Bath provided us with a tourist pass for these Bath tourist attractions so that we could find out the best things to do in Bath with kids, but all thoughts and opinions are our own. Last weekend I wanted to visit Bath with my sister but it started raining so we cancelled that, I am hoping this weekend will be better and we can drive down. 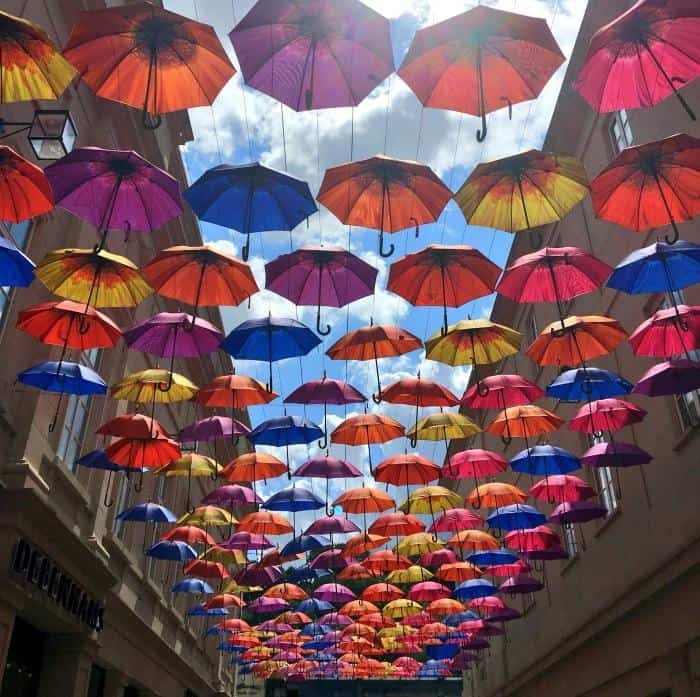 Bath is such an amazing place to visit and I want to see it for myself. Oh we went to Bath in the morning and LOVED it! Those umbrellas are just gorgeous aren’t they, and the phone boxes too! It’s such a lovely city, we only did a day there and just wandered around really, but loved it! Bath is such a fabulous city, isn’t it? So much to see and do! One place I’ve never visited. It looks awesome! I adore Bath! We went there just after our wedding on a little mini moon and I’m desperate to take the girls there. This is great to see that they have so much on offer for children. I best get planning! 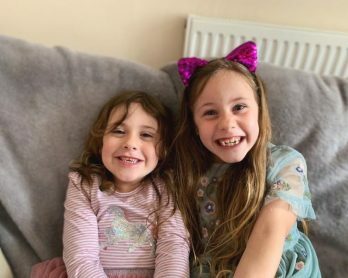 Bath is such a child friendly city we went when my daughter was in the thick of the terrible twos and amazingly it was a wild success because of all of the above! Bath is on my list of places to visit in the UK. I love Roman cities and think it is such a quirky city. This has made me really want to take a trip down there next summer. I do love Bath – I lived in Bristol for a year and it was always great to pop down and visit but I haven’t been back for ages. In my head it’s a very elegant grown up city so interesting to see just how much there is with kids too. 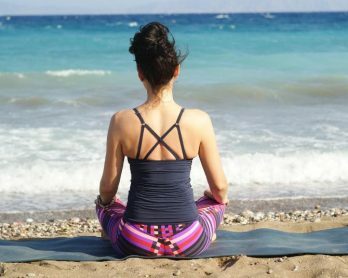 Isn’t it so much easier when you can go off with just one child, and not have to manage their conflicting needs? Looks as though you made the most of everything Bath has to offer. Great that there’s an activity room at the Baths – and the Dragons exhibition looks loads of fun. I would love to visit Bath with the kids. Sounds like an interesting city. I absolutely love bath it is one of my favourite Cities. It is really lovely at Christmas time with the Christmas markets thrown into the mix. I would definitely include the boat trip too. The umbrella shot is amazing. susanna recently posted…San Francisco City Pass: Is it worth it? We love Bath, although I haven’t returned with the kids! I’ve also never had a Sally Lunn cake – they sounds amazing! Bath looks like a fab place to visit and these are some great suggestions! My boys would love visiting the Roman Baths.